After a great weekend for the Galway Magpies in Belfast, they now sit in second place on the AFL Ireland ladder. As a result of enjoying two wins for the day against the Leeside Lions and South Dublin Swans, the Magpies have joined the Lions on three wins for the year, but have just inched ahead of for and against. It puts the Magpies in a great position to fight for second place after the final rounds of matches are completed. The Magpies turned their season around dramatically after downing the Swans by 20 points before taking on the Lions and inflicting a 70-point hiding on the reigning premiers. It was also a huge day for the host team, the Belfast Redbacks. Having won both of their matches on the day, the Redbacks now sit undefeated for the season with seven wins. Finals are always a different beast, but the Redbacks have displayed an air of invincibility this season and will enter the final round and finals series as raging hot favourites for the 2018 flag. Just a couple of rounds ago the Nottingham Scorpions had forfeited a match and were sitting in second last position on the AFLCNE ladder. Fast forward to last weekend and, courtesy of a forfeit by the Merseyside Saints and a tough win the week before against the highly fancied Wolverhampton Wolverines, the Scorpions are looking set to be the Manchester Mozzies biggest obstacle. 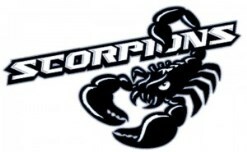 Should they get through to the grand-final, the Scorpions would set up a third consecutive clash for premiership honours. After defeating the Wolverines two weeks ago in a tight battle by just 11-points, the Scorpions have reaffirmed their standing as the most likely challenger – though the race is far from over. It was a day to remember in Northern France on Saturday, when the inaugural Robert MacTier Cup took place in Péronne to mark 100 years since soldiers liberated the town from German occupation in 1918. On a weekend that meant much more than just a football contest to all involved, players, officials and supporters embraced the friendly community to honour the heroics that took place in the small town all those years ago. Arriving on Friday, many players took the bus from London crossing the French border before arriving in Péronne for the jumper presentation at the local Town Hall. It may have read a 64-point defeat on paper, but the weekend’s loss for the West Lothian Eagles against the powerhouse Glasgow Sharks could be their most telling sign of improvement. In their second last developmental game of their inaugural season, they achieved a competitive double – preventing the previously rampant Sharks from posting a cricket score and managing to find enough avenues to goal to have 21 scoring shots. Often, a late season match against a premiership favourite for a team with no finals prospects has crime scene written all over it. However, the Eagles have plenty to play for and were determined not to be intimidated by the Sharks. When the dust settles at season’s end and the review of the Eagles’ development year begins, their competitiveness against all teams will be a key factor in their future. 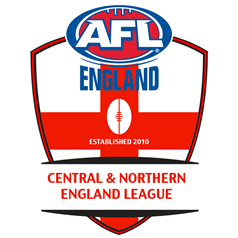 They can rightfully go into their final match in two weeks’ time against the Tyne Tees Tigers with a very real prospect of finishing the season with a win. This weekend in London, the annual London Pride Parade takes place and AFL London and its teams will be there in all the colours of the symbolic rainbow to celebrate. The clubs themselves have outdone themselves this year with a dazzling array of jumpers and club logos which represent the league’s and the club’s commitment to the LGBT community. The following article from AFL England at www.aflengland.org details the event from the AFL London perspective. An exciting assortment of club logos can be found at the end of this article. Each June, LGBT Pride Month attracts millions of participants around the world. AFL England wants to recognise and celebrate the part that LGBT people play in the footy community, both in England and around the world. 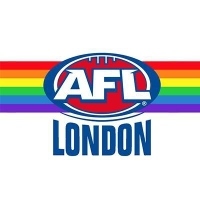 This year, AFL London will become the first AFL league to march in a pride parade, as they take part in the Pride in London festival on July 7th, with the weekend also being marked by a special ‘Rainbow Round’ of fixtures in the capital. 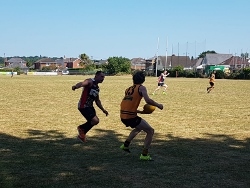 With the second round of the SEWARFL (combined Southern England and Welsh leagues) played on the weekend, the teams from the SEAFL enjoyed a successful day out at Southampton on a hot and largely cloud-free day. Aided by the inability of the Cardiff Panthers to attend, the “home” teams also managed to be ultra-competitive on the field as well. The gap created by the missing Panthers meant that each of the SEAFL teams drawn to play them came away with a forfeit result, meaning three wins from three matches. That in itself would have been a valuable result for the Southampton Titans, Portsmouth Pirates and Sussex Swans, but better followed. The opening match of the day saw the Chippenham Redbacks start in a positive way, downing the Sussex Swans by 30 points. It was an important win for the Redbacks in the context of their own season. 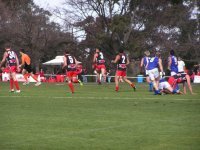 Prior to this win, their best result had been a draw against the Titans in the opening SEWARFL tournament. This win will rejuvenate the team and become a foundation block for the rest of this year and beyond. 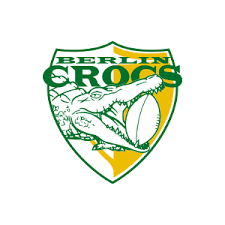 In the only AFLG match for the weekend, and the final match of Round 7 after the Dockers/Lions and Kangaroos/Giants matches were played last weekend (see A Week Is A Long Time In Footy – AFLG), the Berlin Crocs were too powerful for the Dresden Wolves. 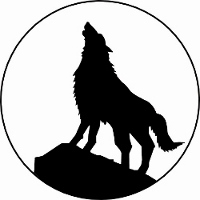 On the scoreboard, the Crocs feasted on an undermanned Wolves team to secure a 162-point win. In terms of ladder implications, the match actually stands as a bye with the Wolves only having seven of a mandatory nine players for the scores to count. Whilst that robs the Crocs of the full percentage advantage from the game, it probably matters little in the grander scheme of finals placings. 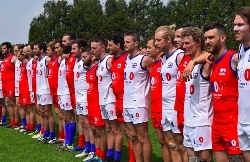 The Crocs still sit in third place, a game and hefty percentage behind the Hamburg Dockers and Munich Kangaroos with each team having just two matches left before finals. 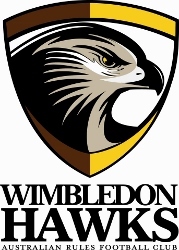 The Wimbledon Hawks have finally managed to get a win on the board after a tough season. Their weekend clash against the London Swans was their big chance to avoid the wooden spoon this season. Whilst they still sit in last place, they are now equal on wins with the Swans and only seven percentage points separate the teams. From here, both teams would be hoping to upset one of the top three teams. However, more likely, it will come down to battle to lose by the lesser margins from here and keep percentages as positive as possible. Playing at home, the Hawks ended up winning comfortably by 22 points, leaving the Wimbledon crowd grinning proudly. The saying goes that if you look a shark in the eye, all you see is a cold, calculating, lifeless stare in return. Just why you would want to look a shark in the eye is an entirely different matter. However, the Kingdom Kangaroos did just that last weekend when they took on the Glasgow Sharks. Already suffering from a lack of preferred player numbers on the day, things got worse for the Kangaroos as injuries to those still standing decimated their list. But this is where the Sharks were at their predatory best. Premierships are not about being the “nice guy”. They are built around the 100% commitment of every player for the full four quarters, week in week out. And, that is as it should be. The Roos kept fighting, but their adversary was just too good and took every advantage available to them as they built towards another flag. Whilst there is plenty that the Roos can rue after the game, they can also take heart that some of the problems they encountered on the weekend are rectifiable and a full list come finals time will see a vastly different herd of kangaroos in the paddock. 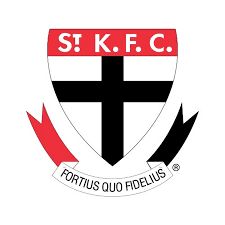 Michael Ryan reports on the St Kilda website about the debut for another young Irish talent with Darragh Joyce playing for the Saints in their exciting win against the Melbourne Demons. In a solid first game, Darragh had 10 possessions. Wearing #39, the new Irish Saint also contributed a creditable team-oriented five one percenters and also kicked a behind. It was a promising start and a great platform on which to build his future. As a fresh-faced 19-year-old, Darragh Joyce uprooted his life and left his family in Ireland to pursue an unlikely dream, and it will all be worth it when he runs out in the red, white and black for his AFL debut this Sunday. It started with a simple email, then a kick in Dublin’s Phoenix Park, followed by a 17,300km journey to the other side of the world, and now finally, the Irishman gets his chance on the big stage.